There was an error on the online scoresheet involving the winning goal in the Everett Silvertips’ 3-2 OT victory over the host Swift Current Broncos on Saturday night. . . . According to the scoresheet, the winning goal came from D Lucas Skrumeda. It turns out that it actually was scored by F Eetu Tuulola, his 15th of the season. Tuulola, who will turn 19 on March 17, is from Finland and is in his freshman season. That was his second game-winning goal. Saskatoon Blades. . . . The Hitmen (22-26-10) are 3-0-1 in their past four games. They now are tied with Saskatoon for the Eastern Conference’s second wild-card spot. The Hitmen, fourth in the Central Division, also are just two points behind the third-place Red Deer Rebels. . . . The Blades (23-28-8) have lost four in a row (0-2-2). . . . F Jesse Shynkaruk gave the visitors a 1-0 lead with his 27th goal, on a PP, at 2:00 of the first period. . . . F Andrew Fyten (6) tied the score at 15:10. . . . 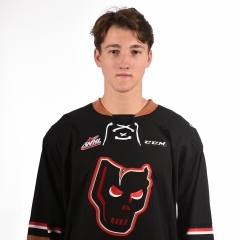 The Hitmen took a 2-1 lead when D Vladislav Yeryomenko notched his fifth goal, at 8:42 of the second period. . . . F Mark Kastelic’s 10th goal upped that to 3-1 at 12:49. . . . F Mason McCarty got the Blades to within a goal with No. 17, on a PP, at 6:38 of the third period. . . . Shynkaruk also had an assist. . . . G Trevor Martin stopped 16 shots for Calgary. . . . At the other end, G Logan Flodell blocked 34. . . . Saskatoon was 2-3 on the PP; Calgary was 0-4. . . . The Blades were playing their third game in three different cities in fewer than 48 hours. 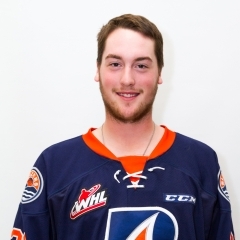 They went 0-2-1. . . . Saskatoon was without F Cole Johnson, who served a one-game suspension after taking a major and game misconduct for goaltending interference on Saturday in Lethbridge. . . . Announced attendance: 6,254. Keegan Iverson equalizing in the second round. F Sami Moilanen won the game as he scored to finish the third round. . . . F Tyler Adams had given Seattle a 1-0 lead, on a PP, at 6:58 of the first period. . . . Portland tied it at 14:22 when F Evan Weinger (18) scored on a PP. . . . F Alexander True’s 20th goal gave the Thunderbirds a 2-1 lead at 2:19 of the second period. . . . The Winterhawks responded with the next three goals. . . . D Caleb Jones (7) scored a shorthanded beauty at 6:19 to tie the score. . . . F Skyler McKenzie gave Portland a 3-2 lead at 13:42. . . . D Keoni Texeira upped that to 4-2 with his 11th goal at 8:50 of the third period. . . . Seattle closed to within a goal at 11:33 as F Donovan Neuls got No. 19. . . . The Thunderbirds forced OT as Moilanen got his 18th goal at 19:14 with G Matt Berlin on the bench for the extra attacker. . . . Seattle got two assists from D Jarret Tyszka. . . . McKenzie and Texeira had an assist each for Portland. . . . Seattle F Ryan Gropp was held off the scoresheet, ending his point streak at 16 games. . . . Portland F Evan Weinger wasn’t able to score on a penalty shot at 16:42 of the third period with his side leading, 4-3. . . . Berlin finished the game with 29 saves, while Portland’s Cole Kehler stopped 45 shots. . . . Portland was 1-2 on the PP; Seattle was 1-6. . . . 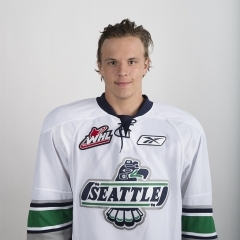 The Thunderbirds, who dressed only 16 skaters, apparently have added F Keegan Kolesar to their injury list. He was a last-minute scratch. . . . Each team was playing for the third time in fewer than 48 hours. . . . Seattle was beaten, 4-2, by the host Tri-City Americans on Friday, then beat Portland 5-3 in Kent, Wash., on Saturday night. . . . The Winterhawks had beaten the visiting Red Deer Rebels 4-3 on Friday. . . . The Thunderbirds (38-17-5) have won two in a row. They are second in the U.S. Division, one point behind Everett with the Silvertips holding two games in hand. . . . The Winterhawks (32-24-4) have lost two straight (0-1-1). They are fourth in the U.S. Division, five points behind Tri-City. Portland does hold down the Western Conference’s second wild-card spot, one point behind the Victoria Royals. . . . In the season series, Seattle is 5-3-2, while Portland is 5-4-1. Yes, the loser point has to go!. . . . The Thunderbirds and Winterhawks will meet twice more this season, too. . . . Announced attendance: 9,233. Regina at Prince Albert, 4 p.m.
Edmonton at Kamloops, 7 p.m.
Moose Jaw at Medicine Hat, 7 p.m.
Red Deer at Prince George, 7 p.m.